9 out of 10 Cell Phones Tested Exceed Government SAR Radiation Limits. Manufacturers don’t test phones directly against the body, like in pants, shirt pocket or in contact with skin. It took a lawsuit in order for the National Frequency Agency of France to release this research from 2015. Cell phone companies are waging a battle similar to those of tobacco companies by war gaming research. Cell phone companies require a minimum separation distance of between 5 and 15 mm for regulatory approval. 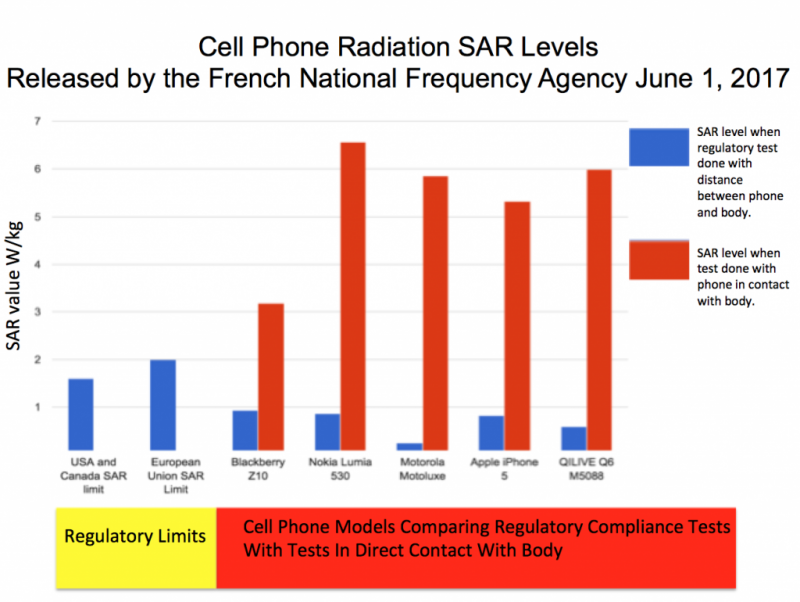 On June 1st 2017, by court order, The National Frequency Agency of France released research completed in 2015 showing 9 out of 10 cell phones exceed government radiation limits when researchers tested the way people actually use them—directly next to the body. The body absorbs higher levels of microwave radiation from a phone when it’s in a pocket, or tucked in a bra. There are a few reasons why. One reason is the phone is much closer than what was required when tested for safe RF exposure levels that are enforced by the FCC. This so-called safe distance that you have probably never heard of is referred to as the “minimum separation distance”, usually found in the phones owners manual. If you have never heard of a minimum separation distance for safe cell phone usage, you’re not alone. The Canadian Broadcasting Corporation (CBC) independent survey of more than 11,000 Canadians found that more than 80 percent were unaware of manufacturers’ recommended separation distance. Now to get an idea of how many people use their phone against their body, the same survey reported 67 percent of cell phone users admitted to carrying their phones against their bodies. Unknownly, these people exposed themselves to unlawful amounts of RF Radiation and a slew of potential health effects that have been attributed to cell phone radiation exposure. The minimum separation distance on many Samsung Galaxy model Smartphones is 15mm, while newer iPhones have reduced this minimum safe distance to 5mm and some of the newest Smartphones like the Essential PH-1 fall in the middle with a minimum separation distance of 10mm from the body. The minimum separation distance of your phone is very important to know! Among the brands tested by the National Frequency Agency were Apple, Motorola, Samsung, and Nokia. When these very popular Smartphones were held closer to the body than the manufacturers minimum separation distance used during SAR testing compliance – some Smartphones emitted RF radiation 300% percent higher than the manufacturers’ reported to comply with the FCC’s maximum permissible level of 1.6 W/kg. These Smartphones are legally considered compliant with RF safety regulations. However, when these Smartphones are tested in the ways that resemble how they’re actually used in real life, such as in your jeans pocket or bra, the amount of radiation emissions absorbed in our bodies violates government radiation safety limits. The US Government Accountability Office (GAO) has come to the same conclusion about the reliability of current SAR safety guidelines. When the RF exposure limit of 1.6 watts per kilogram specific absorption rate (SAR) was established in 1996, phones were big and bulky, not the pocket-sized devices today, and were often carried in holsters and rarely used by children. In a 2012 report, The Government Accountability Office (GAO), which is a legislative branch government agency that provides auditing, evaluation, and investigative services for the United States Congress — made recommendations to The Federal Communications Commission (FCC) that they should review all cell phone radio-frequency (RF) exposure limits, which were set over 20 years ago, now considered very outdated, because FCC rules do not include testing for potential harm from holding phones directly against the body or factor in the latest research on health effects from long term exposure to RF Radiation. By testing mobile phones only when at a distance from the body, the FCC may not be identifying the maximum exposure, since some users may hold a mobile phone directly against the body while in use. Using a mobile phone in this manner could result in RF energy exposure above the maximum body-worn SAR determined during testing, although that may not necessarily be in excess of FCC’s limit.